Isomalt or Isomaltitol is a derivative of beet sugar. Its primary use is to make cake decorations, sugar sculptures and show pieces, but isomalt is also added to commercial candy to enhance and prolong flavor. 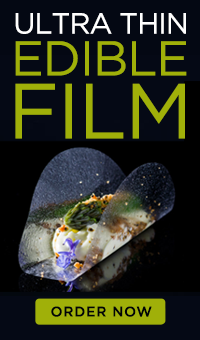 Sugar artists and modern food chefs use it to add drama and creativity to their plates. Isomalt is ideal for sugar art, sugar blowing and decorations because it is humidity resistant, it stays clear and does not caramelize, has considerable durability and shelf life and higher gloss when compared to regular sugar. Additionally, it resists crystallization, making it easier to work with and allowing the chef to rewarm it and reuse it multiple times. In molecular gastronomy, isomalt is used to create dramatic presentations with spheres filled with smoke, isomalt fruits filled with foam, encapsulating olive oil drops and making croquants among other applications. Isomalt is an equimolar mixture of two disaccharides, each composed of two sugars: glucose and mannitol and also glucose and sorbitol. It is produced in two stages. 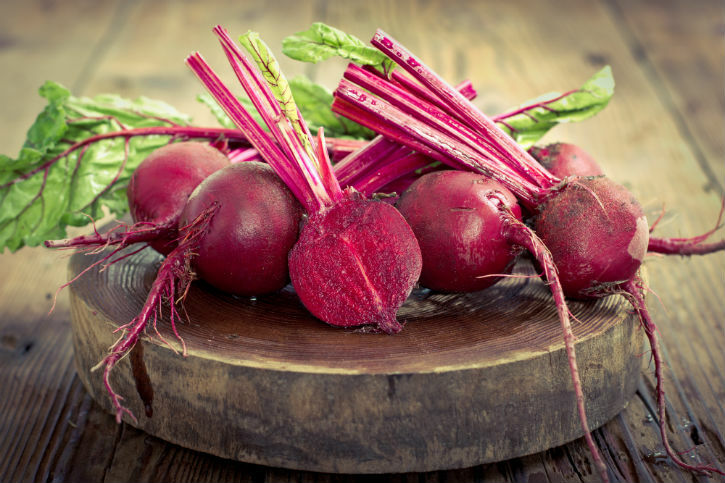 First, chemists isolate the natural sugar compounds from beets (sucrose) and using heat transform it into isomaltulose, a reducing disaccharide. Then isomaltulose is hydrogenated, using a Raney nickel catalyst. The final product is an equimolar composition of 6-O-α-D-glucopyranosido-D-sorbitol and 1-O-α-D-glucopyranosido-D-mannitol-dihydrate. Isomalt was approved for consumption in the United States in 1990. There are a handful of countries that have approved it as well including; Australia, Canada, New Zealand, Mexico, Switzerland, and a few others. Because isomalt can cause gastric distress if consumed in higher quantities, it has not been approved in a vast majority of countries across the globe. While the human body typically treats regular sugars as carbohydrates, it considers isomalt a fiber. Most medical professionals recommend that people limit their daily intake to about 1.7 ounces (50g) for adults, and about 0.88 ounces (25g) for children. Isomalt is classified as a low digestible carbohydrate. It is odorless and white. It has only half of the caloric value of sucrose (table sugar), contains low levels of glucose and it is gluten free. Consuming isomalt only has a small impact on blood sugar levels and it is usually considered safe for diabetics. It does not promote tooth decay and has an effect like dietary fiber in the gut. It also has a minimal cooling effect that is lower than many other sugar alcohols. Isomalt is very resistant to humidity (less hygroscopic), is has a glossy finish and it doesn't caramelize and turn yellowish like regular sugar. It stays clear. It resists crystallization and does not need the addition of acid to prevent it. This allows the chef to rewarm and reuse isomalt multiple times if necessary. Another benefit of isomalt is that it doesn't contain impurities so it is not necessary to remove them during the boiling process. Isomalt retains heat longer than sugar and it needs to be worked at lower temperatures making it easier for the beginner. Overall, it is very easy to work with. Isomalt is commonly used as a sweetener in "sugar free" candies and other commercial products. It has about half the calories of sugar and manufacurers can achieve similar levels of sweetness as sugar but without raising blood sugar levels, without causing tooth decay and with low calories. 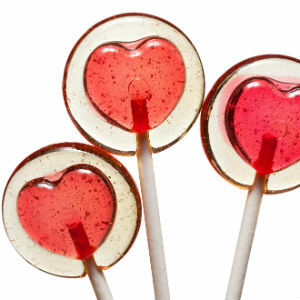 Isomalt dissolves slowly in the mouth so that candies have a longer lasting taste. These properties make it an excellent ingredient for candies, chocolates, baked products and flavored applications such as fruit flavored candy, coffee and chocolate. Isomalt is also used as preservative in breakfast cereals and bakery products such as muffins and breads. It helps keep dry foods fresh and crisp for a longer time. Thanks to its resistance to humidity, higher gloss and clear color, isomalt is mostly used in sugar art competitions, cake decorations, weddings and most recently by molecular gastronomy chefs to create dramatic presentations and desserts. Isomalt can be especially useful in cake decorations such as gems, windows, and mosaics. It can also be used to create sculptures by hand as well as using molds. Because it can be heated to high temperatures as well as easily manipulated it works well with plastic molds as well as hand pulling and sculpting. 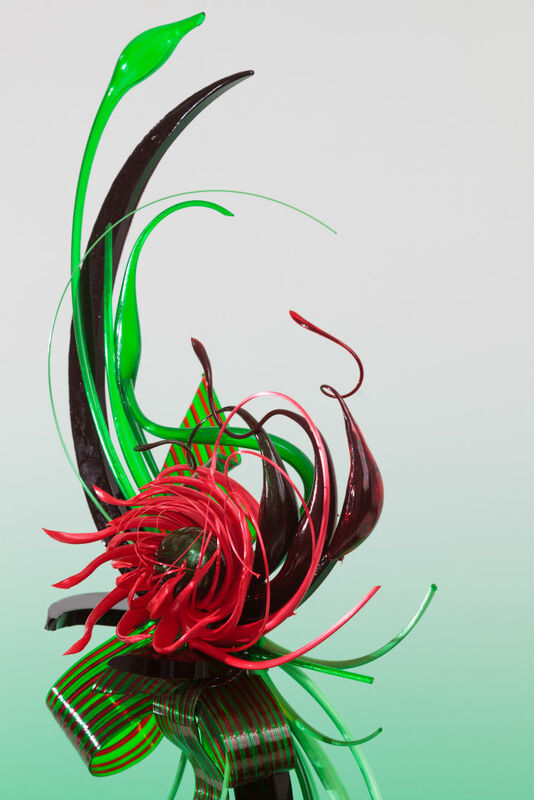 Modern chefs are pushing the envelope on the way isomalt can be used. Pastry chefs such as Jordi Roca from 3 Michelin Star restaurant El Celler de Can Roca uses isomalt to create artistic desserts and garnishes. 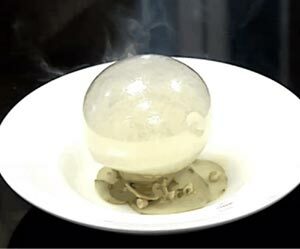 Smoke Filled Sphere – Isomalt has been used by chef Jordi Roca to create smoke filled spheres. One example is an amazing oak smoke filled balloon resting on top of mushroom ice cream. The balloon is made with isomalt using the same technique used to blow glass. The sphere is then filled with oak smoke using a pipe and is placed on top of the mushroom ice cream. Joan Roca says "When you get the smell of the oak, it brings memories and has a comforting aroma". Isomalt Fruits Filled with Foam - Chefs have also used isomalt to create shapes that resemble fruit. 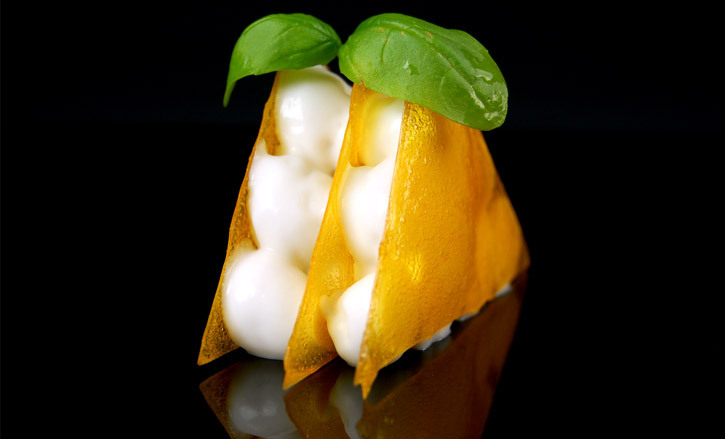 One example by Chef Jordi Roca is an apricot made using the same blowing technique as the smoke filled balloon. The isomalt has some orange coloring and when the balloon is still hot he uses a metal spatula to add shape to the apricot. After cooling it with a fan, he spray paints it with raspberry and adds powdered sugar to add the texture. 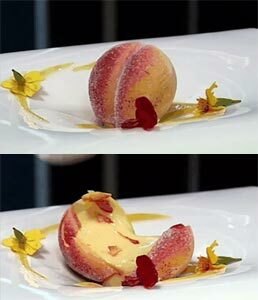 The isomalt apricot is then filled with a foam of apricot. The plate is decorated with concentrated coulis of apricot. Simply delicious! 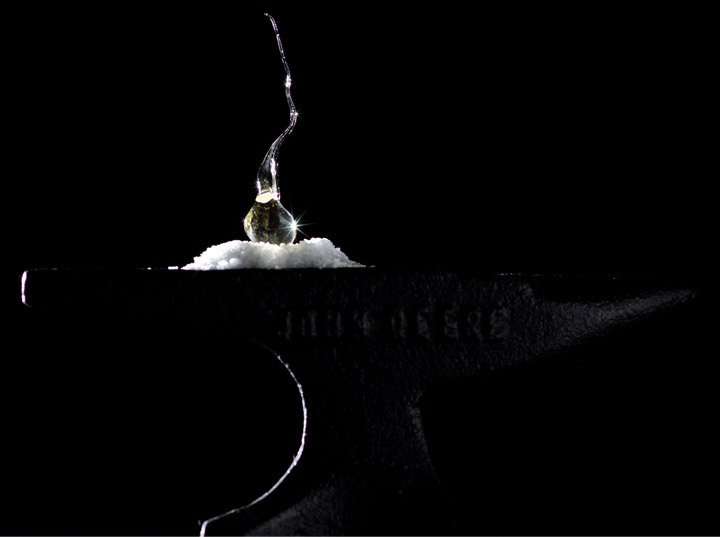 Encapsulated Olive Oil Drop – Another amazing way isomalt has been used is to encapsulate a drop of olive oil. Find the Isomalt Encapsulated Olive Oil recipe here. Isomalt Croquants – Chef Ferran Adria uses isomalt to make fresh fruit and vegetable croquants. In this example, he uses a mixture of isomalt, mango pulp, sugar and glucose to create a beautiful and delicate mango croquant. The dish is both technically innovative and beautiful to look at. Find the Mango Croquant recipe here. Isomalt Crystals – Using isomalt crystals is similar to traditional sugar work and is a little more complicated than isomalt nibs. When using the crystal form you should create the same environment, i.e low humidity and use a candy thermometer to track temperature. Buy Isomalt crystals here. Isomalt Nibs or Sticks – Ready-to-use isomalt nibs are easier than granules and can simply be heated in a microwave. Buy Isomalt Nibs here. Most molds used for cake decorations and sugar art are made from silicone or made especially for hard candy making. You’ll want to be sure to spray the mold with nonstick spray first then pour melted isomalt into it. Be sure to pour it evenly. After it cools, the shape can just be popped out of the mold. Use disposable tools whenever possible because isomalt can be very sticky and harden on tools. Tools such as toothpicks, wooden dowels and silicone are perfect for isomalt work. 1- Pour the water into a medium saucepan and set it over medium heat. 2- Add a small amount of isomalt and carefully stir occasionally using a spatula until it melts. Make sure the isomalt doesn’t touch the sides or it will stick. Keep the sides of the saucepan clean using a clean wet spatula to prevent it from sticking. 3- Repeat step 2 adding small amounts of isomalt until all the isomalt is melted. 4- Boil the isomalt for at least 20 minutes until it reaches a temperature between 165 °C (330 °F) and 171 °C (340 °F). The length of time you boil it will determine the amount of water that will be left in the isomalt. The more water the more elastic the resulting isomalt will be. So if you boil it too fast, the isomalt may contain too much water and may not be strong enough to hold its shape after it is blown. If you boil it too slow, the water content will be too low and the isomalt may crack easily. 5- Pour the isomalt over a silpat mat on a marble counter. 6- Let it cool down until the edges start to harden a little and, using protective gloves, fold the edges inwards. 7- Repeat the process until all the isomalt has been incorporated. 8- Knead the isomalt by folding it in half and letting it fall on itself. Repeat this process until the isomalt is cool enough that it willhold its shape. 9- Start pulling and twisting the isomalt. Hold one end against the silpat and pull the other end to stretch it. Twist it twice and fold it half pressing the ends together. Repeat this process until you obtain a silky sheen. 10- Pull the isomalt a couple of times without twisting. 11- Cut it with scissors in small pieces for storage. 12- Store prepared isomalt pieces in a container with desiccant packets. Once your designs are created, be sure to store them in a low humidity area. Furthermore, over time the affect will get cloudy, particularly pieces with sparkly affect.